So, I was chatting away with a buddy the other day who said, “People who read your blog have no clue how you get at Christmas.” I think he meant it in a nice way. The thing is, I get a little Christmas crazy, throwing lights around anything that doesn’t move. But Sally the Crazy Dog has been festively bedecked on several occasions, so that’s probably not one hundred percent true. Anyway, I thought my friend made an excellent point. It was time to haul out the blog holly. But how? Ah, where there’s a Cathy C. Kringle will, there’s a way. Specifically, a gel clingy way! I splattered those thingies all around my monitor and wheee! Christmas at the Hall of Fame! And here’s the really scathingly brilliant part of this decoration idea: It’s not only transparent but also trans-web! 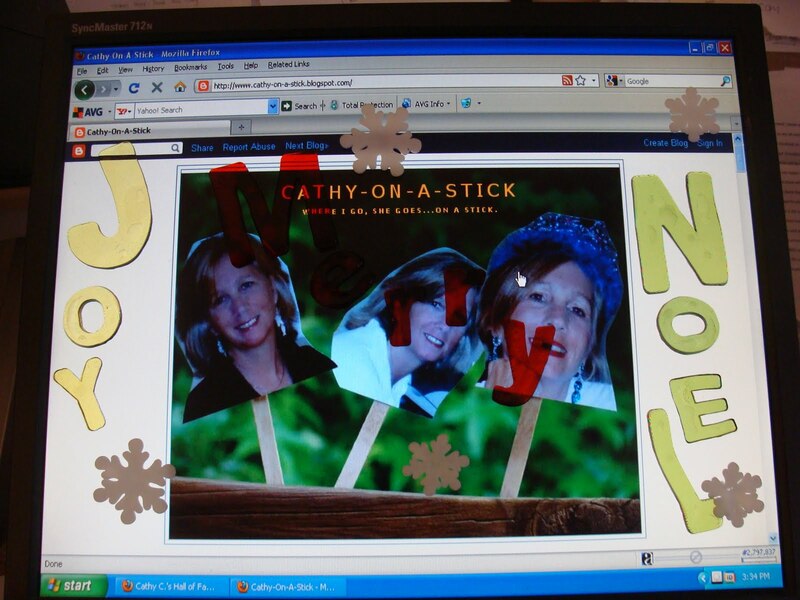 So, it’s also Christmas at Cathy-on-a-Stick! And Finders and Keepers! And even that lousy email in my Inbox! I felt downright jolly about that rejection. And here’s something for you to feel jolly about, especially if you wrote a novel last month. The Amazon Breakthrough Novel Award has been announced for next year and they’ll be awarding two prizes! So, if you wrote a general fiction OR a Young Adult novel, you have a chance to win big bucks and a publishing contract! Read the detailed rules here and start polishing up that scathingly brilliant manuscript! AND, I found another writin g goodie for the Christmas Hall of Fame Giveaway! 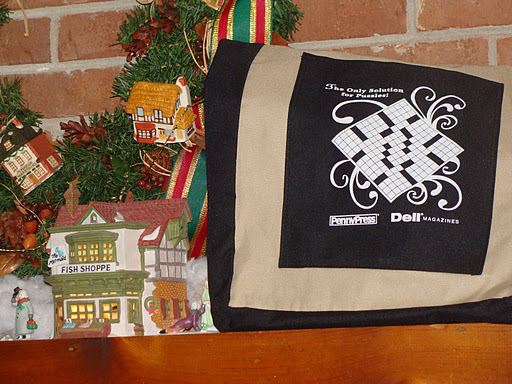 Check out this one-of-a-kind, promotional tote from Pennypress and Dell Magazines. You’ll be the only writer, walking around, stylin’ with your crossword tote. If you win. So add a comment and it’ll go in Santa’s hat. Bet you can guess the 14 letter expression I’m thinking of here at the festive Hall of Fame! ← Writing Snacks For Everyone! I remember one of your Christmas parties where a guest sat in his chair to long and was wearing a string of lights before the evening was over. Among other things! But c'mon, you know you looked festive, twinkling on and off. If this comment a goes in Santa's hat, will it be all covered with sweat and Brylcreem? Oh, who am I kidding. Santa wouldn't use Brylcreem.